It is Friyay! This week was relatively hard for me and I am so happy it is over. New week, new start. As for the weekend, if you are in search for a great haul tomorrow is the big day these pretties will be released exclusively at Selfridges, online and in store. Right now Kimono Set (reviewed here) is available at Selfridges Online. One of the sets to be released this weekend are Murasaki Dahlia Complete with Blend Color Eyeshadow Ex-27 Hanashion and Creamy Glow Lipstick Moist Ex-18 Momosuishou. The second set is called Murasaki Dahlia Eyes and has the same eye shadow palette but combined with Eyeliner Creamy Ex-03. 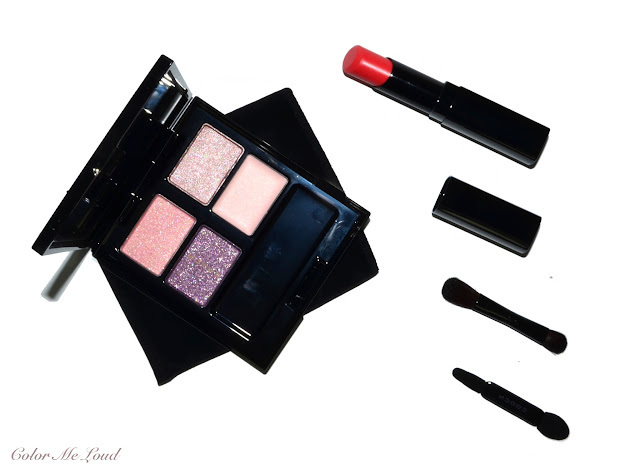 Today I would like to share my thoughts on Murasaki Dahlia Complete Holiday Set. 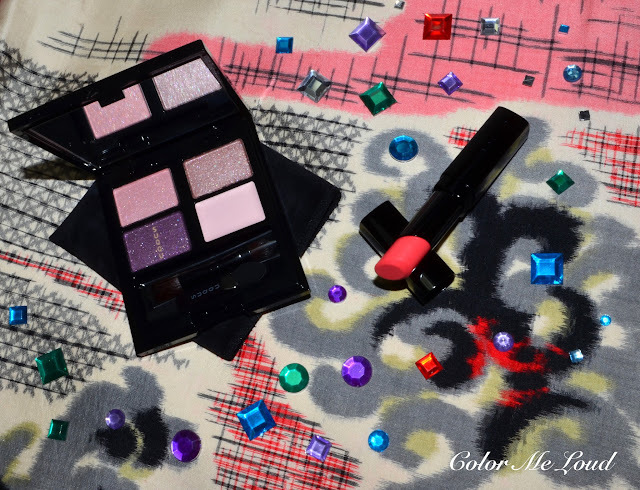 Suqqu Blend Color Eyeshadow Ex-27 Hanashion made my heart frequency double. One of those days when I open a package I might have an heart attack. You know how much I loved the last two palettes from Suqqu, #21 Yoihagi (reviewed here) is so sophisticated and unique, #20 Kaoribara (reviewed here) on the other hand is inviting and so pretty. I usually don't like cream and powder together in a palette but the cream base in these makes the shades adhere so well and evens out the skin tone on my eyes like no other base. 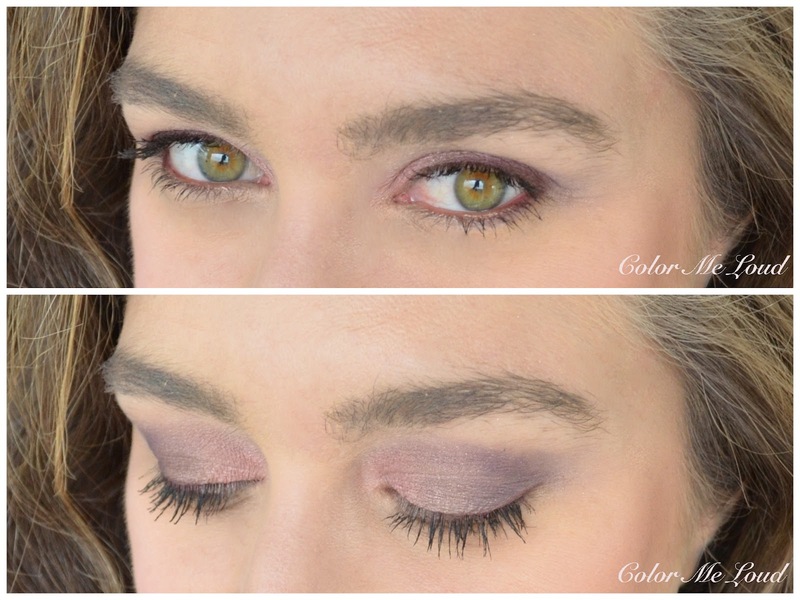 On top the eye shadows appear more vibrant and last longer. 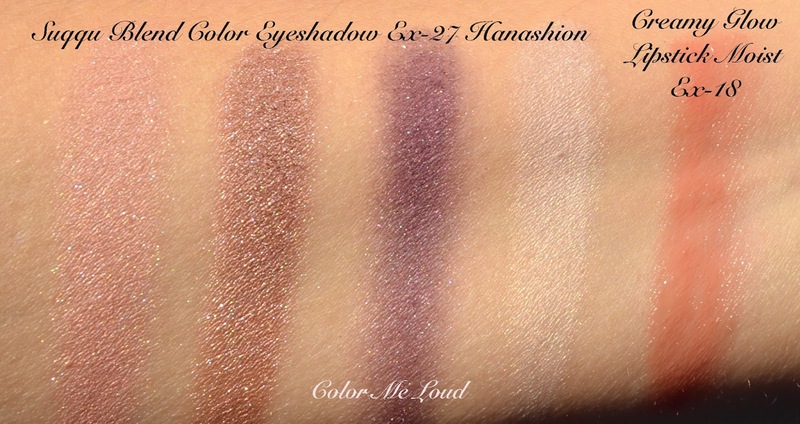 Ex-27 Hanashion has the same formula with the base but the color theme is taupe/purple. How pretty is that? 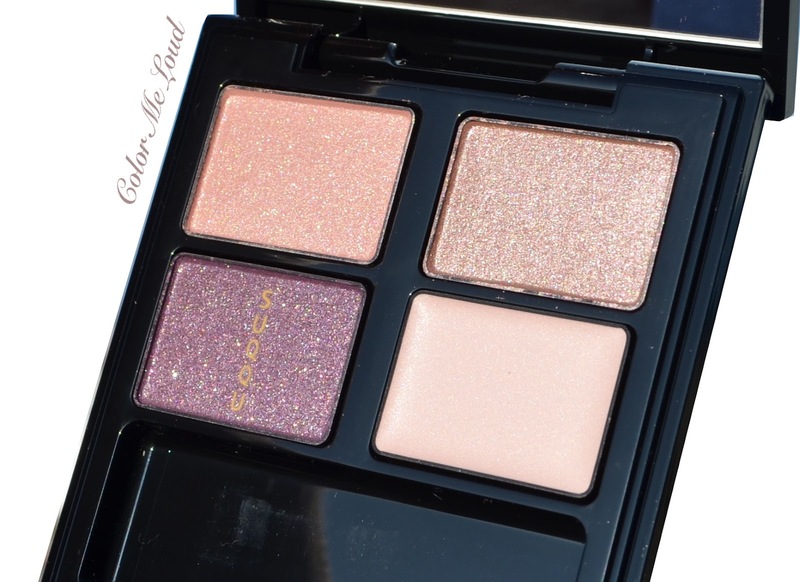 The purple shade has all kinds of soft Suqqu shimmer induced on it and the brand name is gently sprayed on top. With the first use it goes away this was why I didn't dare to use it for a few weeks but I preferred just to stare at it and sigh happily. You can see that the eye shadows appear different from different angles. This is because of the reflective properties. Here are the swatches of the eye shadow quad, Suqqu Blend Color Eyeshadow Ex-27 Hanashion and Creamy Glow Lipstick Moist Ex-18 which comes in the set. The shades in Ex-27 Hanashion are a pale neutral pink with shimmery finish, a medium neutral taupe with shimmer finish, a deep purple with shimmer finish and a white pearly cream base. Creamy Glow Lipstick Moist Ex-18 is a neutral coral shade with a transparency so it looks cooler due to the natural pigments of my lips than it does on my arm. 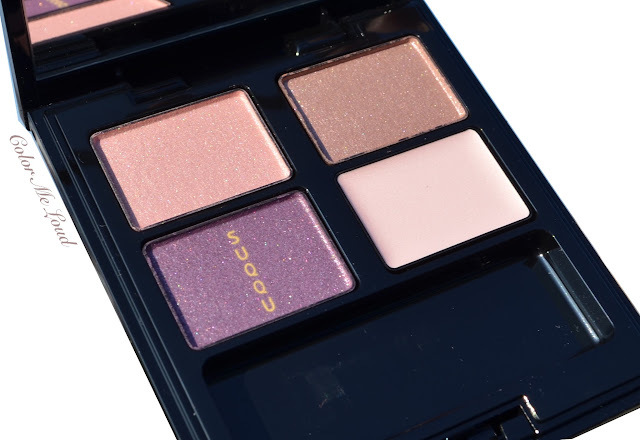 Suqqu Blend Color Eyeshadow Ex-27 Hanashion applies and blends beautifully on the eyes, the usual Suqqu Quality in terms of complex and soft shimmer and the unbeatable longevity. These apply much better on the base shade so I really recommend using it. Here is the look in context. I have been reaching for this combination very frequently. I love how warmer lipstick works with the cooler eye shade, it looks very modern. On my cheeks I have Suqqu Cheek & Face Color Palette Ex-01 (reviewed here). In my opinion a mix of warm and cool shade in the Cheek Palette makes it a great transition shade from eyes to lips. Here is a last look. Suqqu Murasaki Dahlia is too pretty to pass. I hope there will be enough stock for everyone tomorrow, fingers crossed. Final thoughts: If you like taupe/purple combination, you definitely should check one of the Murasaki Dahlia Sets, with lipstick or with the eyeliner, depending on your choice. 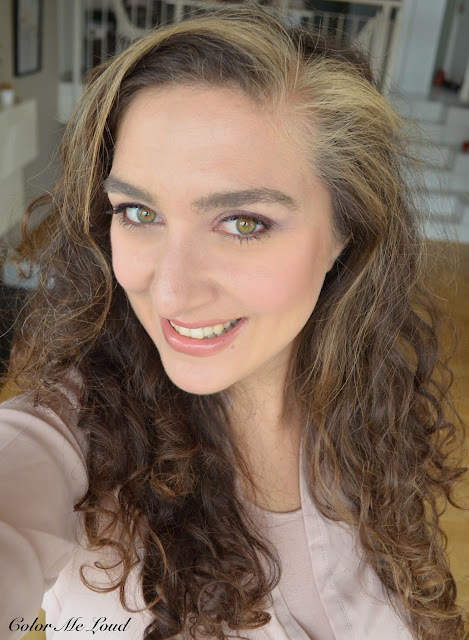 The palette works so well with the rather warm toned Creamy Glow Lipstick Moist Ex-18 so Murasaki Dahlia Set is highly recommended. Availability / Price: Murasaki Dahlia Sets are very limited and exclusive so I hope that if you are in the search, you can get your hands on one. At Selfridges online, they appear to be sold out but I believe they will first be released tomorrow so make sure to check it out. Alternatively you can call one of the counters and order. Murasaki Dahlia Complete is priced at £62 (worth £72) and Murasaki Dahlia Eyes will be £62 (worth £70). Which Holiday Collection made you break the bank this season? I will try to take photo today or tomorrow, whenever I find the time. It is a it busy here at the moment but I will try my best. Yes, it is like my name written all over it! Oh my my, how gorgeous!! ;D These colors look so lovely on you. I love the flash of green shimmer in the pink from the palette! Ah, this is one color palette that is NOT flattering on me. LOVE it on you though, Sara. And that lip color is gorgeous! Jenni, you just left the 10 000th comment!! :-) Thanks!